Day 1 of 15 - Galapagos Fishing - Wow! My crew of Jesse, Tim, and Wayne did not want to start of with marlin, so instead we started the day throwing poppers at yellowfin tuna that were breaking everywhere. The fish we hooked-up ranged from 30-70lbs, but we broke off a couple of much larger fish and saw several fish that were well over 200lbs. We will get one of those before the trip is done. We finally got to test out the new Penn TRQs7 spinning reels and the matching Penn Carnage Rods and they were perfect! 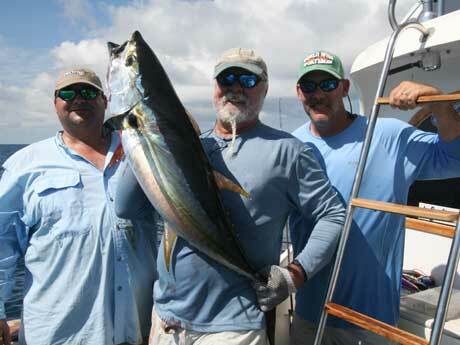 Click here for our recommended tuna tackle for tuna plugging. 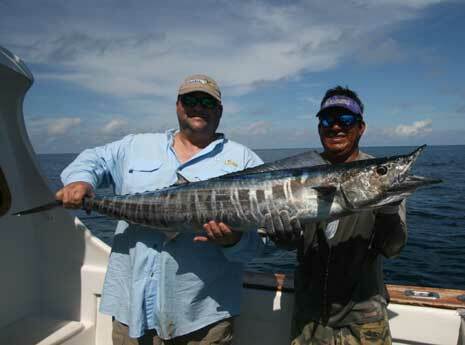 We spent less than 3o minutes trolling for Wahoo and landed one just under 40lbs. The lure of choice was a Yo-Zuri Bonito rigged with a short length of cable. We probably should have spent more time trolling, but we really needed to leave ourselves enough time to do some serious jigging. No one has really spent much time jigging in these waters. This group plans to spend many hours puzzling out the jig bite. Today was a great start and catch included groupers to 40lbs and a variety of other fish whose real names I do not know. They all had local names like bacalao (which probably translates to “the fish that we really like to eat”). The bite was continuous and as we do more and more of this, I am sure the fish will just keep getting bigger. Damn that Pete Santini and his Iland lures! 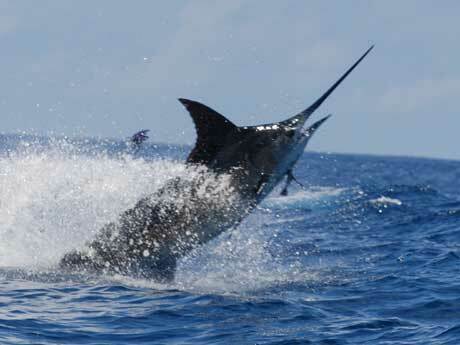 I was sipping a cold one back at the hotel when he and his crew arrived back from their day of marlin fishing. I was feeling quote smug about a job well done and thinking that my crew would have the best stories to tell at dinner. As usual I underestimated him and he blew EVERYONE away when he told us how his group fared. 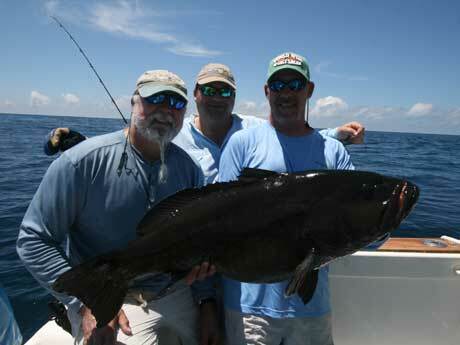 Brian Stensland (Fishermans Supply) caught a blue marlin well over 500lbs on a purple/black Iland Express. Thanks (and no thanks) to Eric at MirroLure who was kind enough to send us the lures. Congrats to Brain for his epic 1:09 hour fight. Jon Ginsburg (first striped marlin) and Tommy Palmisano (first marlin ever) each added a striped marlin and they ended up having a pretty good. Jon took some amazing pics including the one below. Tim Reese catches his first ever yellowfin tuna on a popper and follows it up a few minutes later with his first ever Wahoo on a trolled Yo-Zuri Bonito.